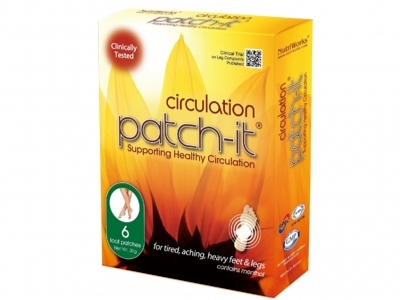 In addition to the key ingredients of the Patch-It Series, Circulation Patch-It contains Menthol, which is well known to be beneficial to healthy circulation and supports the action of the key ingredients. Circulation Patch-It was the subject of a clinical trial where users had been experiencing aches and swelling in the lower limbs. The beneficial effect of Circulation Patch-It in reducing swelling was significantly different from that of a placebo patch. The results of the trial can be viewed here. The Patch-It Series utilises the concepts of Aromatherapy and Traditional Chinese Medicine into easy-to-use foot patches, to aid sleep, detoxification & circulation. Every Patch-It has been formulated with a blend of 100% natural ingredients, including mandarin wood vinegar as the principal ingredient, to simulate the actions of reflexology. Remove patches from their protective wrapper and apply one to the sole of each foot before bed. Use for 3 consecutive nights for optimum benefits and 10 Consecutive nights every month as part of a long-term programme. Notes: Circulation Patch-It may turn wet and a deeper brown colour after use. Note that because of its unique dual action, the patch is effective whether dry or wet after use.